Urasenke master considered mother of chado in United States. 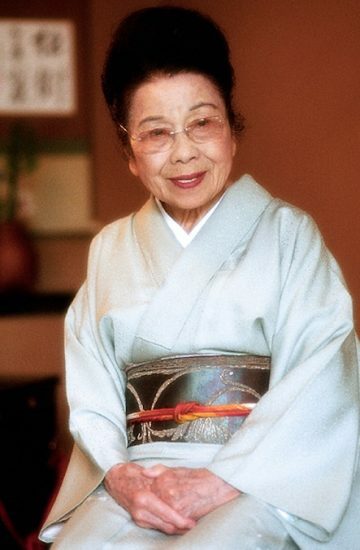 Famed tea ceremony instructor Madame Sosei Shizuye Matsumoto of the Urasenke School passed away on Feb. 21. She was 103. For seven decades, Madame Matsumoto devoted her life to teaching the discipline of chado, an intricate series of steps designed around the act of serving tea. In 1994, she was recognized as a National Endowment for the Arts Heritage Fellow by President Bill Clinton. Throughout her career, Madame Matsumoto shared her love for the Way of Tea to all who were interested: from presidents and prime ministers, to school kids, Keiro residents and Japanese American community members. Students traveled from around the country to be taught by the diminutive sensei. “One of the reasons why she became so successful at teaching is that she liked to teach, and she said anyone is welcome,” Hori said. At her memorial service on March 3, a message was read from 15th-generation Grand Tea Master Sen Soshitsu Hounsai by Fushida Sokei Gyotei, who was dispatched from Kyoto to attend the service. Matsumoto was born on Feb. 21, 1916 in Honolulu. After attending high school in Los Angeles, she enrolled in the French American Fashion Design School and graduated in 1941. At that time, she also began training in the Way of Tea. She moved to Kyoto, and for six years she trained under Tantansai, the 14th-generation grandmaster of the Urasenke School, as well as Hounsai, the 15th– generation grandmaster. Following World War II, Matsumoto-sensei saw that there were few practitioners of Japanese tea ceremony in her new home of Los Angeles, but her desire to start a school was thwarted by the unsettled times of Japanese Americans returning from internment camps. Matsumoto opened her tea school in 1951, the same year she was invited to the signing of the U.S.-Japan peace treaty in San Francisco. Over a four-day period, she served tea to more than 3,000 American and Japanese officials, including President Harry Truman and Prime Minister Shigeru Yoshida. That same year, Matsumoto-sensei was asked to perform tea ceremony at the home of Ray and Charles Eams, noted architects and furniture designers. Among the guests were Charlie Chaplin, Isamu Noguchi and actress Shirley Yamaguchi, who was student of Matsumoto. In 2012, the Eames Foundation invited her back to recreate that iconic moment. 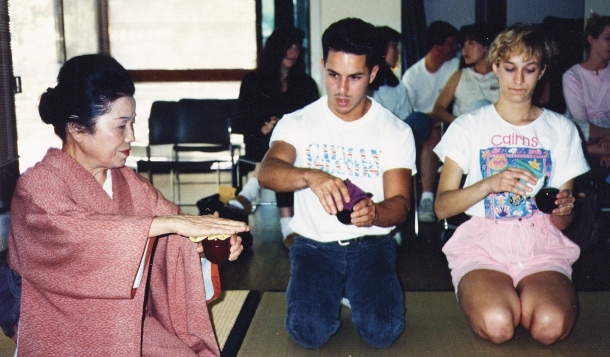 Matsumoto, who taught a credit class through the East Asian Languages Department at UCLA, instructs students in the tea ceremony in 1989. In the 1950s, Matsumoto-sensei introduced millions of Americans to chado through appearances on CBS and NBC television programs. She was also featured in the 20th Century Fox film “Japanese War Bride.” In 1968, she was invited to give a demonstration at the Olympic Art Festival in Mexico City. Keiko Nakada studied with Matsumoto-sensei for more than 40 years, and recalled her as a disciplinarian who expected much from her students. Matsumoto continued to instruct until late last year. “When you do something wrong, she says, ‘What are you doing?’ She would correct it and say, ‘This is how you do it,’” said Nakada. Nakada became a tea instructor herself and is teacher of record at Shoseian Japanese Garden in Glendale. 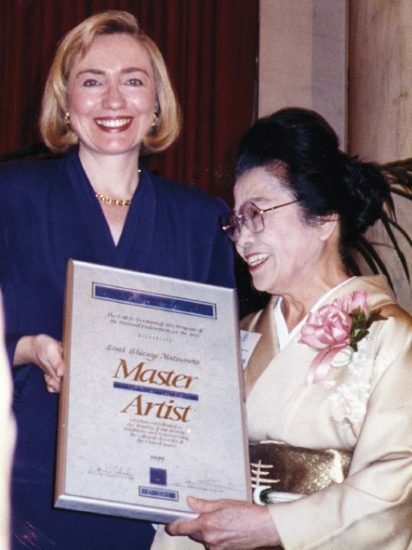 Throughout her long career, Matsumoto received numerous honors. In 1990, the Japanese government awarded her the Order of the Sacred Treasure, Gold and Silver Rays. In 2006, the Japanese American National Museum recognized her with its Cultural Ambassador Award. Most recently, she was honored last November at the Japanese American Cultural & Community Center during a program sponsored by the Alliance for California Traditional Arts. The memorial service at Hompa Hongwanji Buddhist Temple embodied the life of the revered tea instructor who attained the highest teaching certificate available in 1989, receiving the title meiyo shihan or honored master. An offeratory tea was prepared by Fushida Sokei Gyotei and placed before the altar. 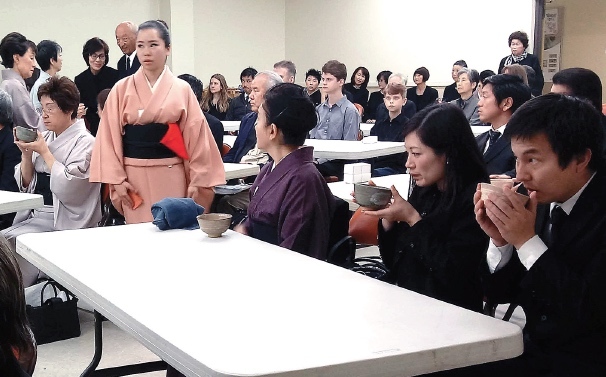 Afterwards, the students of Matsumoto-sensei prepared bowls of tea for the attendees and her favorite sweets were served. A display of some of her cherished utensils were displayed, including a tea bowl used at signing of the Treaty of San Francisco, another bowl was inscribed with the Japanese characters 思遠 (shion), translated as thinking of someone (now) far away.